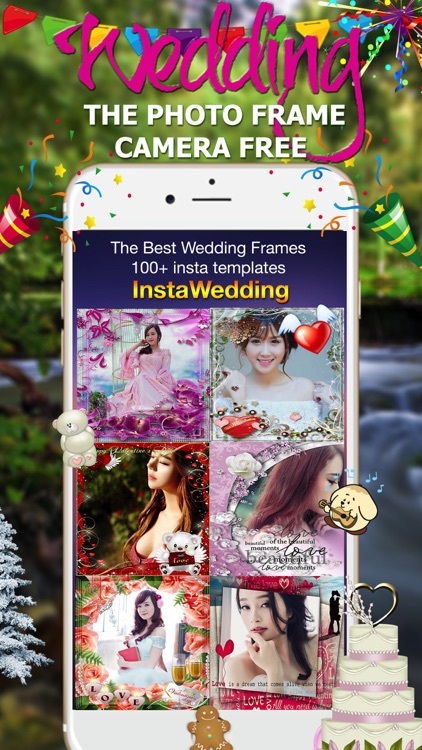 ● Among the top five photo and video apps in 20 countries and regions, InstaWedding Photo Frame is a magic photo makeover, cool and easy to take, beautify and share gorgeous photos on your phone. 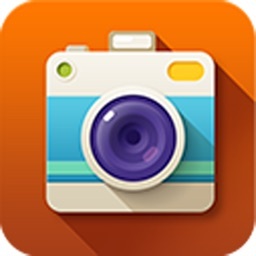 ● Filter Camera: With multi effects, our camera helps you take artistic photos! The camera provides classic effects and makes it easier for you to take beautiful pictures. ● Editing: Cropping, rotating and toning easily. Crop and rotate photos, as well as adjust their brightness, contrast and saturation as you wish. - Beautification: Changing skin tone, polishing, removing acne, enlarging eyes and slimming easily by simply a tap of your finger. We also provide various eyeliners and blushers to enhance the beauty of your photos. - Beauty Filters: tap effects specially designed for portraits that will make you stunningly beautiful in an instant! - Remove blemishes：Tap to remove acne, blemishes or any other skin imperfections. 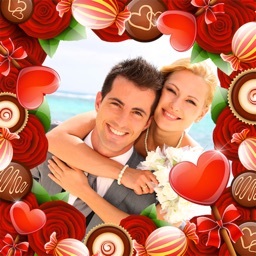 ● Effects: Enhancing photos with all kinds of cool effects, InstaWedding Photo Frame makes your photos the highest quality. 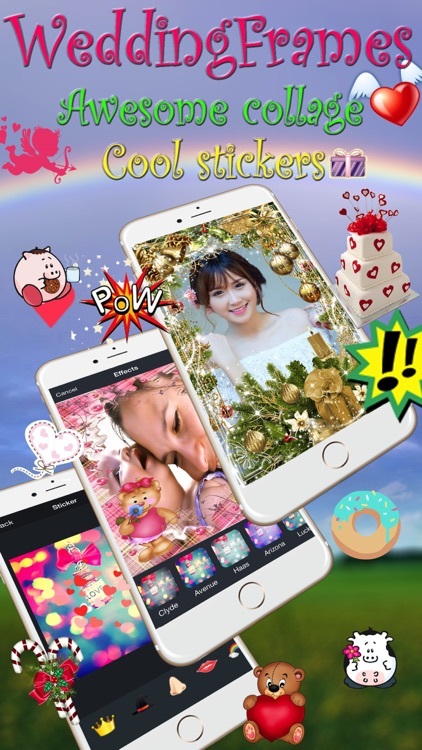 BeautyCamera has a large collection of beautiful and practical picture effects. With one click, you can achieve many cool artistic effects, such as soft light, LOMO, autumn effect, blue tone, old photo, giving just one photo many different vibes. 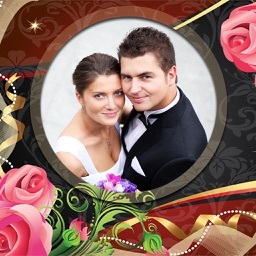 - With a large number of beautiful decorations, InstaWedding Photo Frame presents your individualized photos. 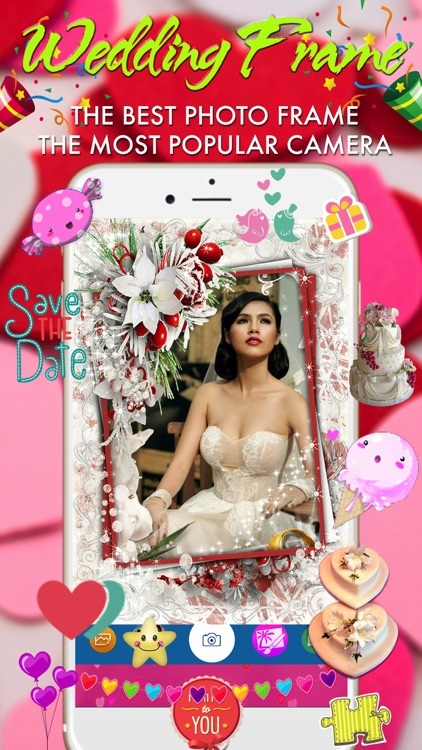 - InstaWedding Photo Frame integrates all kinds of pretty accessories, interesting stamps and fashion text material for you to improvise and enhance your photos! 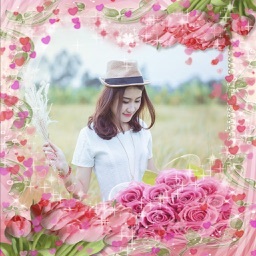 - Make different collages and photo walls using InstaWedding Photo Frame! With 3 different collage modes (150 templates)--template collage, free collage, and photo collage--our app with its rich textures and fresh background will help you present your photos most creatively! ● Frames: We over an extensive selection of beautiful frames, simple and complex, for your use. 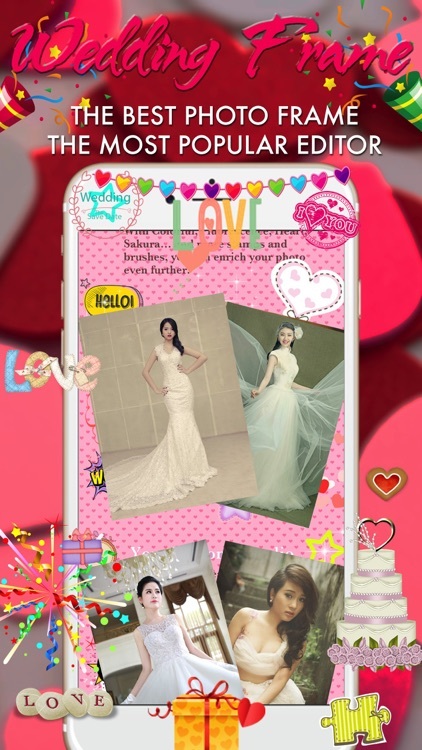 ● Make Your Own Scene: One of our newest features, InstaWedding Photo Frame allows you to transform your photo into a scene from a movie, news casting, or mood, with customizable features like quotes and lyrics you can add to your image, you can now transform a simple photo into something right out of a movie! ● Instantly share your beauty on Facebook, Twitter, etc.